Learning English videos are a great way to explore new topics while improving your English. Each lesson is specially designed to help you practice your listening skills while also learning new vocabulary and idioms. Hearing natural conversation is a perfect way to listen to different accents and hear informal expressions. So are you ready to see a movement? 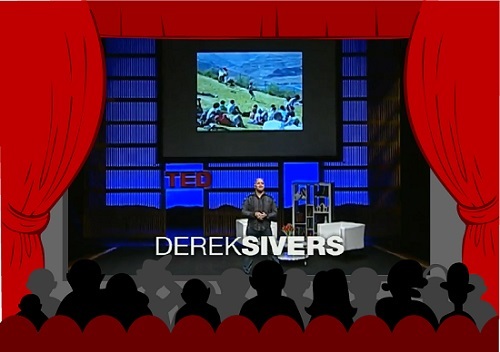 In this 3-minute video, Derek Sivers explains step-by-step how to start a movement. Starting from one "lone nut" to a rousing group of followers, Derek's analysis of how the process works may surprise you. Have you watched one of these learning English videos before? If so, welcome back. If not, please read the instructions below BEFORE you watch the video. These TED Tuesday learning English videos will help you improve your English by just following a few simple steps. I select short videos so that learners will hopefully watch them at least twice. The first time listen for the general idea and the second (or third) for reviewing vocabulary. Reading the transcript is also really important. Step 1: Click on the video above. Step 2: Read the transcript or watch the video with subtitles. Many of the important vocabulary words and idioms have been defined for you. There may be a transcript and subtitles in your own language--check to see. Step 3: The SHORT quiz will help you to test your understanding. Click the link below to get the entire transcript and definitions for all of these vocabulary words and idioms. Selected vocabulary from talk: (click to see all of the definitions). Now for the quick quiz. It's short and easy... TAKE the quiz: no pain, no gain (that means you won't improve if you won't do the difficult tasks - if you won't feel a little pain). Help me start a movement! Okay, I'd love to start a movement! I pull together these learning English videos and lessons with hopes that others will join in the discussion. So I will be the "lone nut" starting this movement. Who will be my first follower? C'mon you can do it! Please leave a comment below!